As a child, perhaps you tried to invent a new language with your friends, or merely came up with a new phrase so that parents or teachers or what have you didn’t get to know the kind of stuff you were actually getting up to. Codenames and made-up, just-for-you languages have made an appearance in nearly everyone’s lives, even if yours just consists of you doing a gibberish vocal warmup in an acting class once or something. 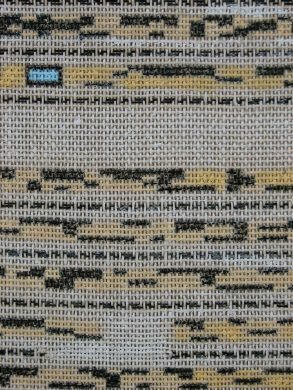 Technologically-inclined artist Beryl Korot has also created her own language, but it’s inspired by something a little more mathematical: the grid pattern formed from woven cloth. Her solo exhibition A Coded Language will showcase work made between 1980 and 2017, many of which utilize this language of the grid, initially created in 1980. In addition to this language’s presence, she also pays tribute to others who have forged their own way of communicating, such as Dutch Jewish writer Etty Hillesum, who wrote to her friends in code during the Nazi invasion in Holland. View from installation at the Studios at Mass MoCA. Opening Friday, April 13 at 56 Bogart Street, 6 pm to 9 pm. 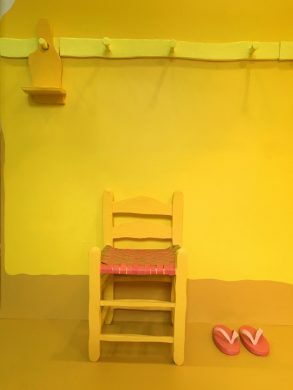 On view through May 27. This is not just one art show, and despite the name, it’s not 56 art shows. Rather, Sculpture 56 is a (still fairly sizeable) collection of 11 exhibitions all housed in one building: Bushwick’s bustling 56 Bogart Street. As the part of the name that isn’t “56” may have led you to believe, this is indeed a show where sculptures will have their special moment. Appropriately, the group of exhibitions seeks to display sculpture in all its many forms, so don’t expect just an endless array of freestanding shapes or (literally) chiseled human forms. Instead, you’ll feast your eyes upon selections like Amie Cunat’s site-specific Meetinghouse at Victori + Mo, inspired by the artifacts of colonial religious radical group the Shakers; Tom Butter’s 11-foot tall “kinetic” sculpture that moves; Honey Ramka gallery’s showcase of clay and ceramic works, and more. Opening Saturday, April 14 at Storefront for Art + Architecture, 5 pm to 7 pm. On view through June 9. Even if you’d never been to one before November 2016, you’re more than likely now familiar with politically charged marches. Aside from being surprisingly exhausting to take part in, especially if you’re not wearing your most comfortable shoes (I found this one out for myself folks), marches have been a method of getting your voice heard, whether it’s to celebrate or protest. 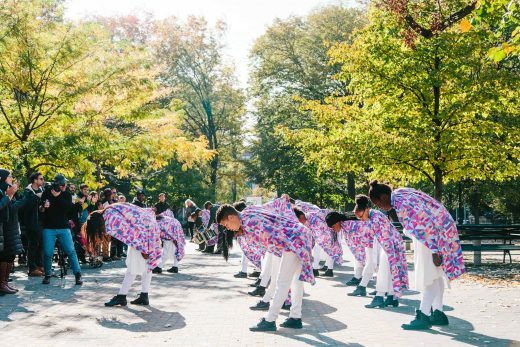 In Bryony Roberts and Mabel O. Wilson’s new research-based exhibition Marching On, a spotlight is shown on not only marches but the historic presence of African-American marching bands and drumlines in these public displays. In addition to featuring performances from the Marching Cobras, a youth music, drum, and dance group based in Harlem, the exhibition uses photography, fabric, text, and more to explore how black marching bands have served through the years as platforms for cultural expression, protest, and visibility in times of segregation and discrimination.